A visit to Fort Mackinac is a must in order to fully appreciate the adventurous life that early Islanders experienced. Watch the excitement as history comes alive right before your children's eyes! 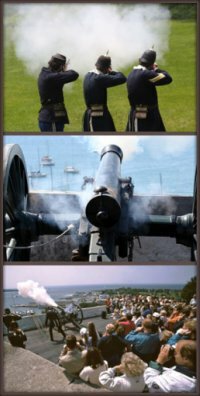 Visit the fort and travel back in time to the 1800’s where you can view rifle and cannon firing demonstrations, displays of historic artifacts, and listen to fife and drum music all in a picturesque, old-fashioned setting. You can spend the day visiting exhibits and enjoying demonstrations on the parade grounds. The tour guides are knowledgeable, helpful, and entertaining. You will find the men dressed in Prussian-inspired uniforms of the day and the women in period style dress as well. The Fort Tea Room is managed by the Grand Hotel featuring the Grand's great food. 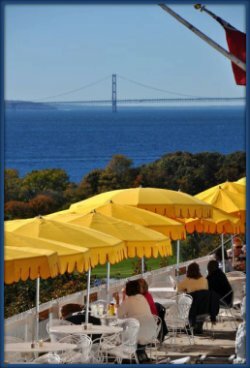 It is a delightful place to rest your feet and enjoy a wonderful lunch while taking in a magnificent view of the Straits of Mackinac where the Mackinac Bridge looms in the distance and freighters pass. This incredible view is one of the best on the Island! 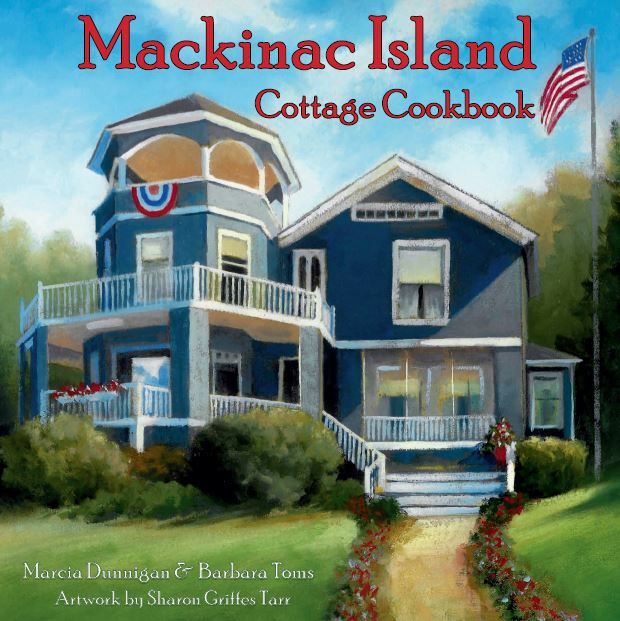 Beautiful quilts, historic books, Mackinac Island inspired specialty gifts, and even historic toys guaranteed to delight children fill the aisles for your pleasure! No Mackinac Island vacation could be complete without taking in the historic sites. Be sure to visit the Richard and Jane Manoogian Mackinac Art Museum too! Your Fort or Mackinac Art Museum ticket also grants admittance to several historic buildings in downtown Mackinac Island from mid-June through late August. Be sure to stop in after you tour the Fort. The Benjamin Blacksmith Shop is one of these buildings and is a working blacksmith shop with ongoing demonstrations. It's quite fascinating! Don't miss visiting the Original Butterfly House when needing a quiet and fun activity. for a casual lunch or dinner picnic style...don't forget to try their prized Fried Pickles! It's located on the quiet side of the Island. Golfing at Wawashkamo is a great chance to enjoy this historic link golf course on beautiful Mackinac Island. Insider Tip: Become a Mackinac Associates member and enjoy free admission to all of Mackinac State Historic Parks' museums and parks as well as a 15% discount at all six museum gift shops. Inquire about the details on becoming a member when you purchase your tickets. 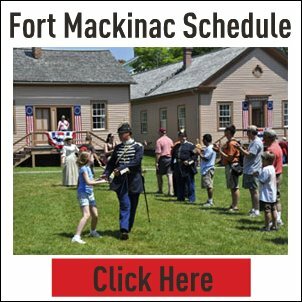 The Fort Daily Schedule is filled with exhibits, interactive activities and demonstrations making it easy for you to feel as if you have literally stepped back in time. Click here to read more about the history of Fort Mackinac. 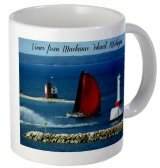 Return to Mackinac Island Vacation from "Fort Mackinac"